I recently had the great honor and privilege to write the liner notes for an upcoming re-release of the Joe Cuba Sextet’s They Must Be Doing Something Right. 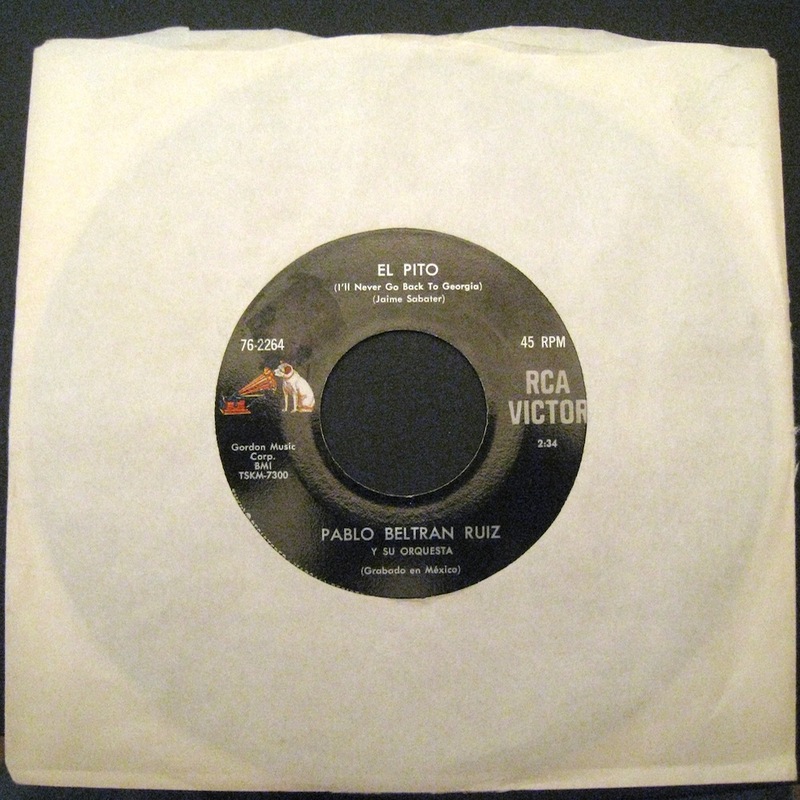 That album’s big hit was “El Pito.” With its titular whistle and the repeated refrain of “I’ll Never Go Back to Georgia” (borrowed from Dizzy Gillespie/Chano Pozo’s “Manteca” even though none of the Sextet had actually been to the state), “El Pito” wasn’t the group’s most successful song (that belonged to their next major single, “Bang Bang”) but it’s arguably their most infectious. Not surprisingly, “El Pito” proved to be popular with other Latin groups and notably, found an eager ear throughout the larger Latin music world. That included covers by everyone from Peru’s Alfredo Linares to Venezuela’s Frank Hernandez to this, recorded by Pablo Beltran Ruiz in Mexico. Unlike most other covers, Ruiz’s omits the catchy “I’ll Never Go Back to Georgia” line in favor of a MOSTLY instrumental affair, replaying the vocal line with a bank of horns instead. “El Pito” essentially gets a big band makeover – where the Sextet was punchy with their small size, Ruiz sweeps in with something closer to a mambo orchestra, making “El Pito” sound as if it was recorded a decade before it actually was. The whistle though? That’s there. You can’t very well record a song called “El Pito” and NOT have the whistle and no matter what else in the song may change, that five-note melody inspires instant recognition…and an inevitable smile. Great post. Thank you very much! Never heard this rendition of “El Pito” before. Be sure to check out O-Dub at Soul-Sides.com, undoubtedly the dopest audio blog on the net. I hear vocals on this version, singing the “georgia” refrain, though it sounds like he’s saying “I’ll never come back from…” Am I missing something? You’re correct; I should have said it was a MOSTLY instrumental affair compared with the original.